Contained within the hundreds of enthralling exhibits in Geneva’s Patek Philippe Museum are several sections devoted entirely to enamelled watches. Richly decorated, in a vivid palette of colours, the timepieces glow with the intensity of gemstones — as much as three centuries after they were created. It’s a sobering thought that, a few decades ago, this intriguing and beautiful craft came within a hair’s breadth of being confined to museum collections. In the 1970s, with Swiss watchmaking reeling under the impact of quartz technology and a sea-change in aesthetic tastes, enamelling was on the verge of extinction, kept alive by a mere handful of artists who barely made a living at it. Widely regarded as the world’s greatest miniature painter in enamel, Suzanne Rohr recalls that at the age of 30 in the late 1960s, she still couldn’t afford to rent her own flat. When Francis Donzé set up his enamelling studio at home in the watchmaking town of Le Locle in 1972, most people wondered how he would make ends meet. That’s hard to imagine today, as the great majority of haute horlogerie houses include enamelled pieces in their collections. For many, it remains a specialised sideline, which does not diminish the exceptional quality of those pieces. It simply cannot be more than that because of the scarcity of craftsmen: now working exclusively for Patek Philippe, Suzanne Rohr has a waiting list of more than two years for her tiny masterpieces. Her protégée, Anita Porchet, has gone from being unemployed in 2000 to having “not enough hours in the day”, working on commissions from Jaquet Droz, Piaget, Vacheron Constantin, Patek Philippe, La Montre Hermès, Chanel and Parmigiani. (You can recognise a Porchet dial by the tiny AP signature, usually painted on the lower right-hand side of the dial.) The premature death last year of Dominique Baron — acclaimed for her work with DeLaneau, Roger Dubuis and Van Cleef & Arpels — has left a gaping hole in the ranks of these artists. Given the growing demand for timepieces that marry high artistry with mechanical brilliance, several of the leading maisons have set up in-house enamelling studios. Jaeger-LeCoultre was probably the first: in 1991 Miklos Merczel, then one of the Maison’s master watchmakers, fell in love with some antique enamelled watches. Immediately, he began to teach himself the craft and, in 1996, completed his first pieces: a series of Reverso casebacks inspired by the art of Alfonse Mucha. Merczel soon took on a talented apprentice, one Dominique Baron; today his protégée, Sophie Roche, heads Jaeger-LeCoultre’s growing group of artists alongside her mentor. The output of Cartier’s enamel workshop at its fine-watchmaking manufactory in La Chaux-de-Fonds has ranged from the Rotonde Ours Polaire of 2009 to this year’s Ballon Bleu Flying Tourbillon Enamel. 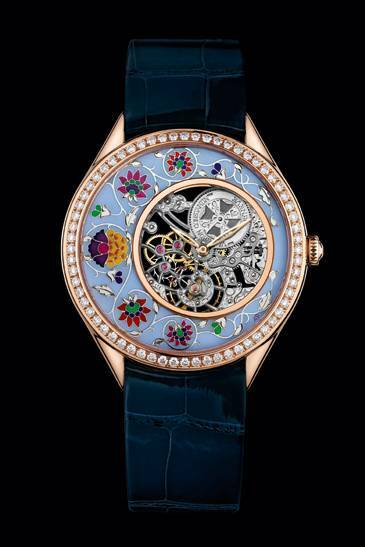 Van Cleef & Arpels, while collaborating with Dominique Baron on its Poetic Complications dials, also built up its own enamelling atelier and has produced a new collection in its Extraordinary Dials series every year (this year is the Lady Arpels Zodiac), usually combining multiple techniques in a single piece. Donzé Cadrans, the successful enterprise that Francis Donzé’s tiny home-based studio had become, was bought in 2012 by one of its clients, Ulysse Nardin, not only to help underwrite a future for the craft, but also to secure Ulysse Nardin’s own production of enamelled pieces. Its speciality — pure white grand feu enamel dials, as seen on its Marine Chronometer — has made it famous among connoisseurs worldwide. 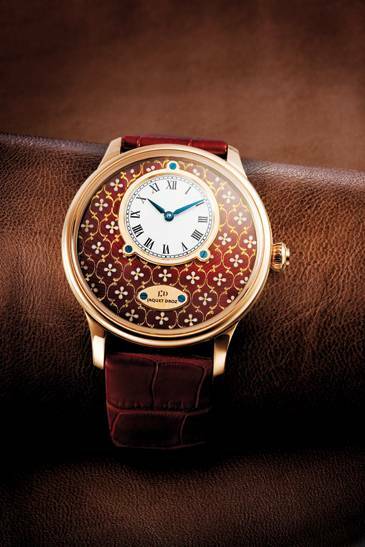 DeLaneau, whose entire output is centred on artistic dials and cases, established its own enamelling studio in 2004, in the heart of Geneva where it specialises in the sous fondant technique, which involves sealing an enamel-painted dial under multiple layers of transparent fondant or flux enamel. Given great creative freedom, DeLaneau’s artists continue to break new technical boundaries, as demonstrated by last year’s extraordinary Tulip Fields pieces, part of the Flower Fields collection, which employed a pointillist painting technique that had not been successfully achieved before. It takes about a decade to master the craft of enamelling, so it’s little wonder that most companies don’t make the names of their enamellers public, for fear of their craftsmen being poached by rival firms. Those who suceed in the field — especially those who specialise in miniature painting, rather than the “simpler” enamelling techniques — must possess a combination of artistic skill, manual dexterity, rock steady hands, the eyesight of a hawk, the patience of a saint and nerves of steel. The last is needed because an enameller is playing with fire. Literally. Enamel is formed by the fusing of vitreous material and pigments under intense temperatures of more than 800°C. An enamelled watch dial needs as many as 15 to 20 firings, each one building the intensity and depth of colour. While every firing increases the beauty of the piece, it also increases the risk: the enamel may bubble or crack; it may burn and, as a result, shrink; the colour may not turn out as expected as pigments are transformed by the heat, sometimes unpredictably; the gold dial base may warp or begin to melt. And finally, at the end of firing, if the piece is removed from the heat too quickly, the enamel can crackle. It must be heartbreaking if this happens so late in the process — after days, weeks, even months of work. It is impossible to repair the damage; the piece must simply be thrown out and the process begun again. Enamel is, essentially, glass powder mixed with metallic oxide pigments. Purity is crucial and enamellers hoard their powders and guard their sources jealously. The powder needs to be further washed and ground, a task done by feel and even by the sound of the mortar and pestle, rather than by appearance. The powder particles are, literally, microscopic, but if they are not perfectly even, the enamel surface becomes pitted during firing. Applying the colour to the dial is a task that involves hours of sitting at a binocular microscope, using exceptionally fine brushes. For miniature painting they may be made of only one or two sable hairs — all the better to paint a horse’s tail hair-by-millimetre-long-hair on a Jaquet Droz Petite Heure Minute Chevaux; for cloisonné and champlevé they are slightly thicker (maybe five hairs) but manipulating them at 25x magnification is like handling a yard broom, while the particles of enamel look like small boulders. Every time the artist wants to deepen the shade of a given colour or add a layer of detail, the dial must be fired; sometimes, depending on their chemical composition, certain pigments cannot be fired at the same time as others. It’s a process that cannot be rushed, with an outcome that can only be guessed at, never guaranteed. This is what makes it so intriguing, and goes a long way to explaining why enamelled works are so highly priced and highly prized. These pieces, created by the hands of exceptionally talented humans, are jewels on a par with the most precious of stones.